The bow tie, once regulated to strict preppies and conservative college professors, has exploded into a men’s fashion staple over the past few years…and it shows no sign of waning. 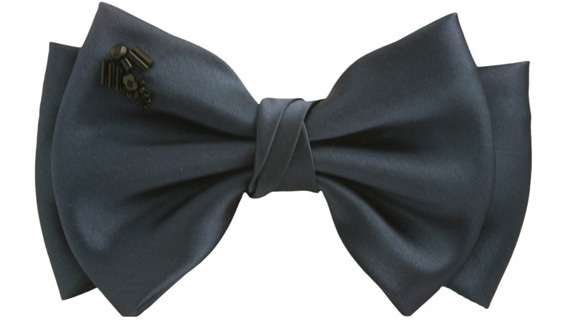 This simple rectangle of fabric, tied into a bowknot, can add a jolt of personality to any gentlemen’s wardrobe. Above: A playful display of Laurent Desgrange’s exuberant bow ties in a smorgasbord of colors, shapes and sizes. French designer, Laurent Desgrange, has been pushing the boundaries of the traditional bow tie (albeit the clip on bow tie) with some wit and panache for the past few years...and he doesn’t disappoint with his look book for Spring/Summer 2011. Mr. Desgrange playfully experiments with the scale of the bow tie. 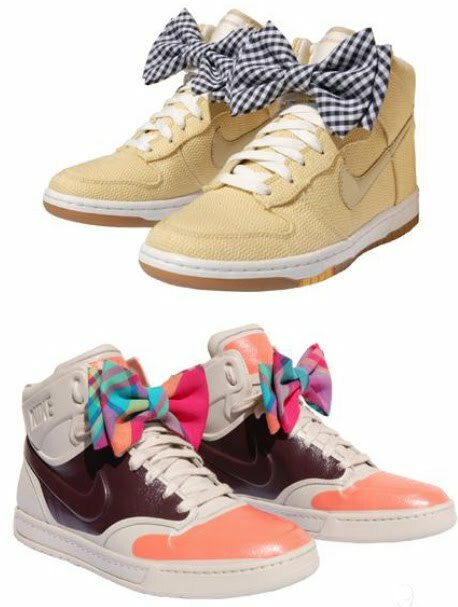 And he even elevates a sneaker with playful bows. Of course Mr. Peacock adores the toile shirt (which will be available in blue and red). You don’t have to wait until next spring to wear one of Mr. Desgrange's hand made bow ties. This dark blue satin tie, with tiny bead detailing, would be chic for summer weddings. 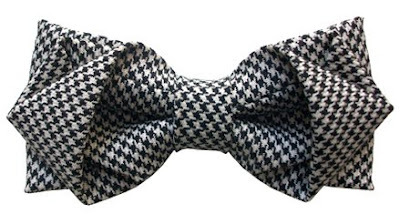 And I love this black & white houndstooth “origami” tie. Each tie comes with satin ribbon and a clip—so you can wear it however you prefer. They’re not just for the gents either; the ladies can wear them as a belt, headband, or hair clip. Admittedly, Mr. Desgranges daring use of bow ties might not suit every gentleman peacock, however, his exquisite shapes and fabrics will seduce even the most conservative of old-school bow tie aficionados. I'll refrain from commenting on the clip-on bow tie, having not seen Desgranges' work first hand; and use this space as a bow tie aficionado (to the point of not wearing a traditional tie any longer) to endorse Seigo neckwear to Mr. Peacock's New York readers. Seigo Katsuragawa's self-named shop doesn't have a website, but you really need to visit yourself to see the breathtaking and overwhelming variety of bow ties (and traditional ties, pocket squares, ascots, scarves), all handmade from luscious kimono silk. And the price points? Insanely reasonable: around $50 for a bow tie, $80 for a traditional tie, $45 for pocket squares - the same as, say, Brooks Brothers, but light years ahead in terms of beauty, craftsmanship and uniqueness. Speaking of the latter, Seigo only cuts 12 of each design. TJB loves Seigo and has amassed a collection of about 50 bow ties and coordinating pocket squares from them in less than a year - I recommend them without reservation! You, sir, are a brilliant little devil. I love, love, love these ties! The dark blue satin with tiny beading... well, my heart is all a flutter! Very fun pics! I've only worn a bowtie when I wear a tux. Mr Peacock, sir. There's a typo in your post. I'm sure you intended "relegated" not "regulated". 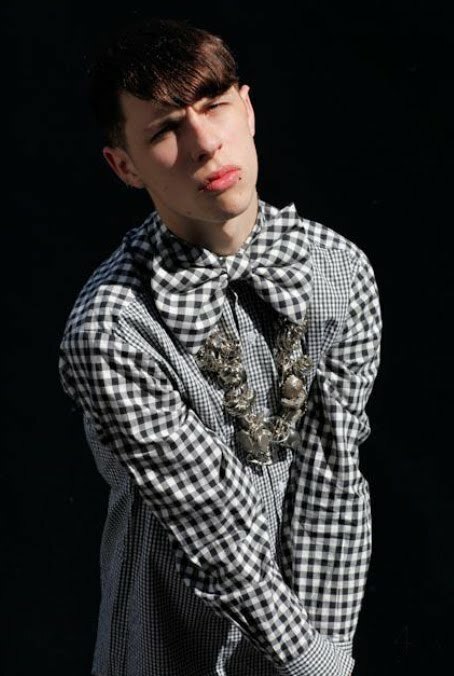 OMG...those shoes with checked bows are uber cool! Just discovered your blog and now I am freaking out that I might lose it amongst my bookmarks. PS: your music taste is exquisite! I will never forget how fantastic it was to receive the Juliette of the Spirits screenplay book from you - so beautifully wrapped and with a feather from your tail thrown in! hello mr. peacock, it's been a while since you've posted, come back! Although I am not ready to accept a clip-on bow tie, the origami model made me pause for a moment to reconsider. As one of the few architects that still uses a pencil, bow ties are a practical satorical accessory. I love the idea of using bowties on casual shoes! Brilliant! I love all the bowties in here!!! What a great thing to see somethings like this especially the shoe. I agree with you Suzanne!! I am impressed. Very much.. I love all designs. Its very nice. All are different colors and designs. first pic is very funny. lol!! Thanks for sharing. Wearing suits again and going back to my southern roots and also wearing bow-ties more. Think they are making a comeback. Marvelous photos and i really enjoy your photos and got new ideas from it, your every thing looking nice. Thanks for sharing. Brilliant, beautiful. 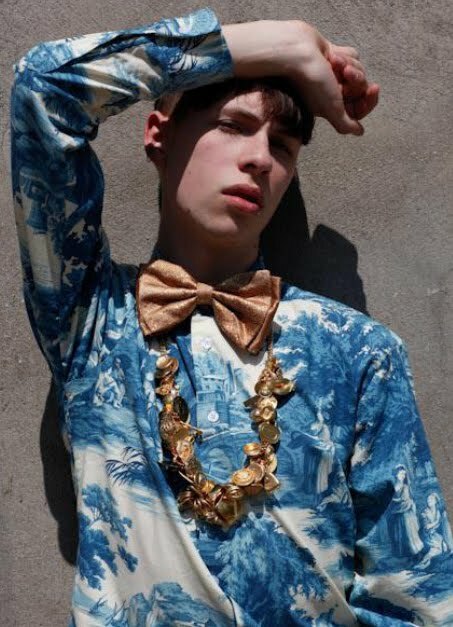 I love the new take on bow ties. For year, I travelled to London and my father in law always stopped at Burlington Arcade and always added to his supply of bow ties. Just this week, I paid tribute to him, Col Fred Tilston VC. I like your working on this web, thanks for update posting i get required information from this website. LOve the origami bow tie. You can just wear a simple dress and your Black chain strap bag can compliment your outfit. Women who wear Black Leather Boston bag can sometimes look great. Bow ties are fun and lovely specially when wearing tux or smart casual dresses... I would never think of this color combination, but I’m loving it. HI hello~ please visit our handmade stuff shop in etsy~ we sell handmade natural soaps, phone charms and many more~ thank you and have a nice day! i love your main articles,the information is really nice for site visitors. I really enjoyed from your shared photos. This guy seems like crazy for bow ties. Well good job. are never in fashion, but they’re always stylish. You could wear a bow tie in nearly any context, and still look good, You could add a bow tie to any outfit for any scenario.